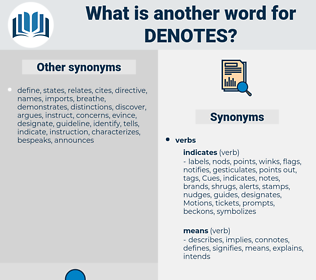 What is another word for denotes? indications, stands, points, lists, pinpoints, signals, signs, expresses, tells, Voices, displays, amounts, flags, designates, accounts, states, reports, represents, signifies, identifies. 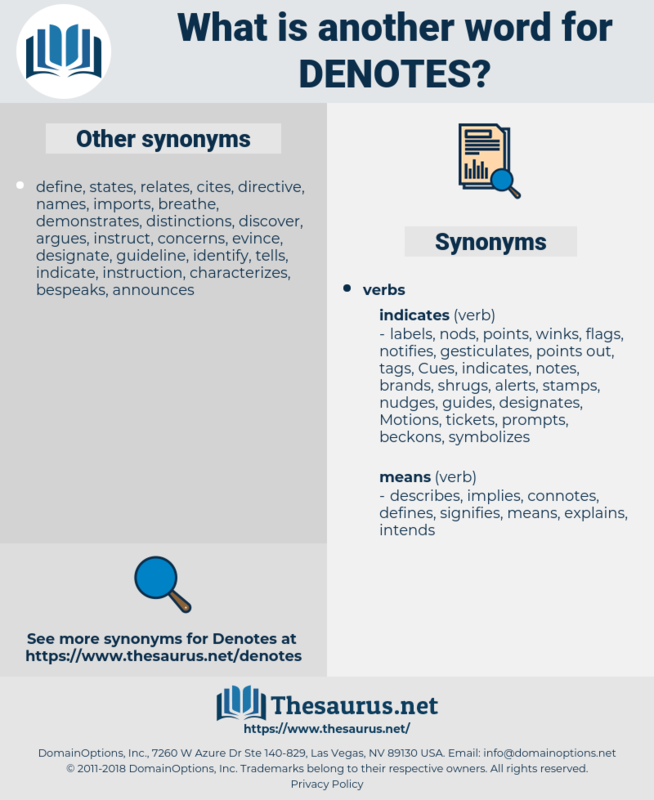 designate, demonstrates, Indicating, delineates, demotes, incorporates, accommodates, contends, commemorates, enumerates, constitutes, contemplates, determines, illustrates, distinguishes, notes, nominates, calculates, depicts, necessitates, encapsulates, communicates, coincide, coincides, contributes, characterizes, anticipates, quotes, correlates, generates, suggests, mentions, indicator, cites, concludes, allocates, equates, resonates, characterises, underscores, acknowledges, symbolizes, stipulates, underlines, correspond, corresponding, introduces, celebrates, outlines, writes, articulates, dictates, reminds, converts, encompasses, implicates, pertains, conveys, portrays, labels, infers, renders, testifies, emphasises, attest, attests, defers, consists, declares, governs, responds, assigns, highlights, epitomizes, embodies, emphasizes, alludes, invokes, cautions, understands, presents, relegates, implies, reference, references, confirms, possesses, explains, asserts, predicts, concerns, Specifying, enjoys, compares, permeates, relates, traces, involves, classifies, exemplifies, showcases, stresses, delivers, evokes, sends, reproduces, presupposes, comprises, includes, notifies, Manifests, summarizes, establishes, selects, Addresses, informs, directs, certifies, Entailed, surrounds, entails, warrants, proclaims, advises, recognizes, subtracts, discloses, adverts, deals, solidifies, conjures, Affects, evidences, summarises, resembles, consumes, overlaps, symbolises, Comes, enters, finds, removes, prompts, observes, instructs, warns, maintains, remands, elects, proves, occupies, is, offers, prescribes, returns, typifies, underpins, imposes, stands, concurs, satisfies, alleges, appears, covers, poses, adds, captures, dismisses, verifies, clarified, clarifies, spells, reveals, conforms, marks, Recalls, brings, parallel, parallels, seems, embraces, affirms, betrays, equals, chooses, argues, submits, agrees, Tallies, totals, qualifies, REPS, sets, accords, Tracks, affords, features, speaks, says, fulfills, remits, discusses, complies, arrives, Focuses, matches, singles, fulfils, points, suits, aligns, serves, reads, asks, mirrors, frames, Gives, sees, falls, plasma, lists, puts, remembers, looks, raises, pinpoints, fits, signals, meets, expresses, tells, displays, amounts, makes, designates, accounts, states, reports, shows, represents, signifies, identifies. On the 19th we advanced by the same road the French had retired, till we reached the town of Salinas, where there were very extensive salt - works, as the name of the place denotes. Turning now from the influence of medievalism to that of humanism, we may remember that in the drama even more than elsewhere humanism denotes a revolution in the spirit of the age, an emancipation of the individual mind from the fetters that had bound intellect and imagination through the Middle Ages. Detainment, dainty, denude, domed, de-iodinate, dented, dead end, donated, deaminate, denuded, dent, donut, deadened, dint, damned, dead hand, diamonte, diodontidae, dimwit, detent, done with, diatomite, dominant, dominion day, daunt, dead-end, dimmed, diamond, dimity, denudate, danaidae, demantoid, dimout, diomedeidae, downwind, denouement, day in day out, dandy, demand, detonate, dine out, dominated, dinette, dementia, dominate, donate, dynamite, demented, de-ionate, dante, dmd, dim-witted, demode, demote, demimonde, diminuendo, down-and-out, denominate, dentate, diamante, detente, daunted, danaid, day in and day out, doomed.